Arch support sandals have come a long way since they first debuted more than five decades ago. These days individuals with plantar fasciitis and other arch support issues can find stylish sandals without compromising comfort. If you suffer from plantar fasciitis, then you know how critical arch support is. Whether you are shopping for sneakers or sandals, proper arch support can make or break your purchase. Buying sandals without arch support could potentially exacerbate a foot injury, or at the very least, leave you in pain after a day on your feet. Sandals with built-in arch support typically cost more than ones without; however, the comfort they provide is something you cannot put a price tag on. 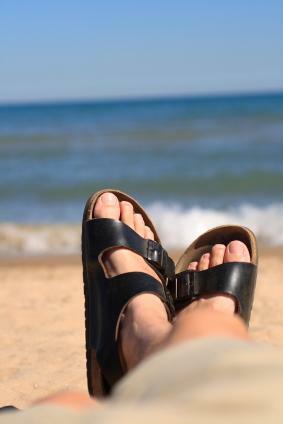 Fortunately, individuals in need of orthopedic sandals now have dozens of stylish options to choose from. The specialty sandals come in a variety of colors and are equipped with optimal arch support and footbed contours that match the shape of a person's foot. Worn properly, sandals with arch support can reduce pain, re-injury, and may improve stride issues. The fashionable sandals for men and women offer a built-in16-millimeter arch support, heel cup and fabulous flexibility. What's more, the sandals are extremely stylish. Moszkito sandals sport full leather uppers and leather straps lined for comfort. You will never have to worry about arch support when wearing Moszkito brand sandals. The sandals also feature a contoured footbed to prevent arch and heel pain, plus customers can choose from a huge array of colors, styles, and materials, including suede and leather. Propet is known the world over for its superior shoes and sandals specifically designed for people with foot problems. The company has been in business since 1985 and has a loyal following. Their specialty sandals with arch support come in wide and extra wide sizes and feature added depth to help make sure feet have the room they need. Propet sandals also offer shock-absorbing outsoles and hook-and-loop closures that adjust to the exact size of your feet. If you have arch problems or flat feet, some Propet shoes and sandals come with built-in arch support to help lift and support hurting or collapsed arches. Spenco's Total Support Cushioning System is a best seller among people with arch problems. The company's durable, comfortable and fashionable sandals absorb shock, prevent overpronation and provide an advanced arch support for stability and all day comfort. Spenco sandals, which provide superior arch support, are casual enough to wear to the beach or during a stroll to the park. When shopping for a sandal with exceptional arch support, it is a good idea to try on as many styles as necessary in order to get the right fit. In addition, people with foot issues, especially those suffering from fallen arches, tend to find more support with sandals that feature adjustable back and side straps rather than those that simply slip on. Finally, when trying on sandals with added arch support, pay close attention to how well they fit rather than focusing on the actual size. Not all sandals are created equal, and some may run bigger than traditional footwear.